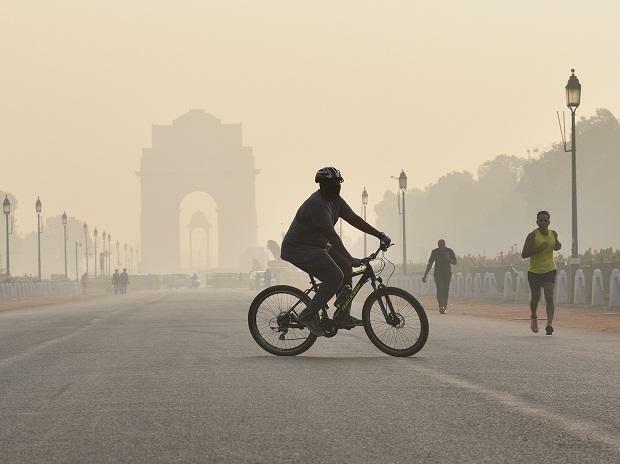 The air quality in Delhi deteriorated slightly on Saturday as the air quality index (AQI) shot up to 282 at 1 pm, according to Central Pollution Control Board (CPCB) data. Delhi had witnessed an improvement in air quality on Friday due to rains in various parts of the city. The Ministry of Earth Science's website SAFAR showed the PM10 (particles in the air with a diameter of less than 10 micrometres) level at 181 and PM2.5 level was at 103. Authorities said on Friday that air quality is expected to improve to 'moderate' in coming days. "Rain scavenging of suspended particular matter has contributed towards the improvement of the region's air quality. The slow improvement in "AQI" despite of good rain is mainly due to isolated rainfall in different pockets," Officials told PTI. Apart from the high pollution level, people residing in Delhi also had to deal with fog. According to the Indian Railways, as many as 13 trains coming towards Delhi are running late due to low visibility on the railway tracks. The minimum temperature on Saturday would be around 11 degree Celsius and the maximum temperature is likely to be 22 degree Celsius. According to Skymet Weather, Sunday will be partly cloudy and light rain is expected on Monday.